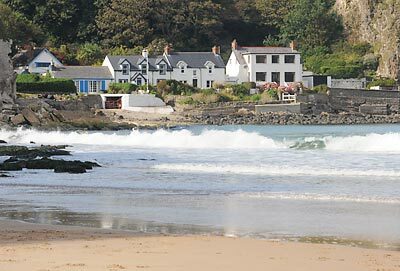 Tucked away at the base of a cliff-face on the western end of White Park Bay is the tiny hamlet of Portbraddan. The tiny row of quaint cottages owe their origins to an old fishing station where salmon were netted up until 2001. Outside the first in the row of cottages is one of the more unusual tourist attractions of Northern Ireland. 'Saint Gobban's Church' has developed a reputation as being the smallest church in Ireland. It is non-denominational and open as a place for meditation. The interior is decorated with plaques commemorating causes to which the church has made it's annual donation. 'Portbraddan Cottage' is another of the houses along this cul-de-sac. It is owned by the National Trust and rented out in a self-catering capacity.